Home > Economic policy > Macroeconomic Indicators, Economic Growth > ING Bank Czech Republic: Credit remains solid but is there a warning sign? ING Bank Czech Republic: Credit remains solid but is there a warning sign? June credit banking statistics confirm a favourable trend across households and companies. But new housing loans signal a slowdown ahead. 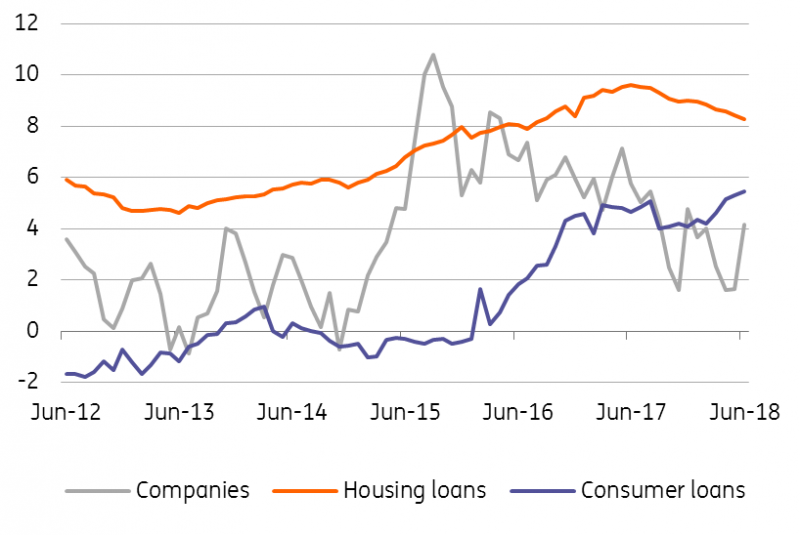 Total credit remained favourable in June, as housing loans grew by 8.3% year-on-year while consumer loans accelerated by 5.5% and corporate loans rose 4.2% YoY. As such, total credit to the private non-financial sector increased by 6.1% in mid-2018. Still, new loans, which provide some forward-looking information, signal a slowdown ahead. The volume of newly provided housing loans reached CZK20.5 billion in June, which is the highest in the last 12 months. So the June figures surprised on the upside, but from a year-on-year perspective, they are still down 5%, and the total volume in the first half of the year remained slightly below the first half of last year. As such, while credit activity remains high this year, it is lagging slightly behind last year’s prints due to a combination of higher mortgages rates, tightened macroprudential recommendations by the Czech National Bank (CNB) with respect to the Loan-to-Value ratio, as well as relatively high real estate prices and their limited supply. Also, the base from the first half of last year is high, as households were frontloading loans due to stricter CNB regulations ahead. Given the new set of CNB macroprudential regulations starting in October, overcoming a record-high 2017 in newly granted volumes is unlikely this year. Interest rates on mortgage loans stagnated in June at 2.4% driven by longer-term market interest rates that began to decline in the second half of May. Still, current market expectations regarding CNB hikes ahead are pushing market rates up again and have reached the highest level in seven years. This suggests that mortgage rates will increase in the next few months after a short pause and may reach around 3% by the end of this year. The volume of new consumer loans remained solid in June, but some gradual deceleration in newly provided volumes is apparent in data this year after double-digit growth in 2017. However, this might be related to the fact that some banks used consumer credit as residual financing for those households which did not fulfil CNB recommendations regarding the LTV limit for mortgages. However, this practice was curbed by the CNB in the middle of last year. The volume of newly granted koruna loans to non-financial corporations amounted to CZK46 billion in June, which is well above the year-to-date average (c. to CZK31bnn). This is a rather positive new development as new loans to companies have been muted in the last three years due to the preference of euro-denominated loans (its share increased to 30.5% in June) and their own sufficient financial reserves. The recent improvement might be due to accelerating investment activity but we still need to wait for more data to confirm a possible change in trend.